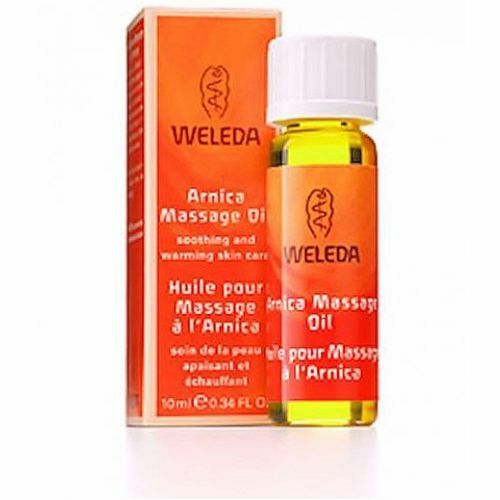 Get natural relief for tight, aching muscles with Weleda's Arnica Massage Oil. Weleda's Arnica Massage Oil harnesses the power of arnica flower extract and organic sunflower seed oil to warm and hydrate your skin on contact. When used in conjunction with massage therapy, Arnica Massage Oil unwinds tight muscles for fast, effective relief. This massage oil is preferred by massage therapists around the world and can be used at home for some well deserved relaxation. Let the warming sensation and fragrant essential oils melt away stress and leave you feeling calm and rejuvenated. Say goodbye to sore, tired muscles with Weleda's Arnica Massage Oil. Order it at eVitamins now and pay less! Ingredients: Helianthus annuus (Sunflower) Seed Oil, Olea europaea (Olive) Fruit Oil, Fragrance (Parfum), Arnica montana Flower Extract, Betula alba Leaf Extract, Limonene, Linalool, Geraniol and Coumarin. Directions: Apply a small amount of Arnica Massage Oil onto damp skin. Massage in a circular motion (always towards the heart) until it is absorbed.